The bond beam is a vital component of the pool structure, set during construction. 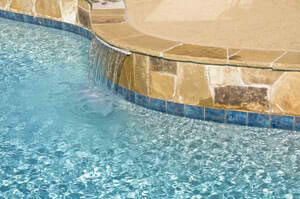 It is a horizontal concrete element, usually reinforced with a larger diameter steel rebar, beneath the pool’s coping. Its purpose is to provide added strength to the pool wall. The upper portion of the pool is exposed to many elements, such as expansion and contraction from heat, therefore extra support is beneficial and needed. The bond beam can also add surface area to the top of the pool, which increases the strength of the coping and provides additional area to add plants and rock features. Not all pools utilize the bond beam; however it is a smart choice when building your Houston pool. Since bond beams provide extra support, it helps to extend the life of your pool. This includes maintaining the integrity of the attached coping and preventing wall cracks. Pools with a bond beam are stronger than pools without one. There are instances where issues can arise due to a weak bond beam. Cracks can occur and often it will be visible from tiles falling off the coping. Repairing a broken bond beam is an extensive process as the coping and tile have to be removed. Therefore, it is important to ensure your Houston pool builder engineers and chooses ideal components for the bond beam.